The Leica DISTO X3, X4 and S910 laser rangefinders have been added to the product range by Leica Geosystems. The robust devices of the DISTO series enable not only simple distance, area and volume measurements but also the measurement of complex objects. The devices operate with an accuracy of ±1mm in a measuring range of 0.05m to 150m. The S910 is equipped with X-Range power technology and offers an even larger range of up to 300m, and also with the same high accuracy. The DISTO X products can sustain falls from a height of 2m, making them ideal for harsh construction site environments. All other DISTO devices sustain falls from a height of 1.20m. In combination with the adapters DST 360 or FTA360-S and a tripod, the laser rangefinders can be extended to form a stable measuring station and offer users maximum flexibility and reliability. 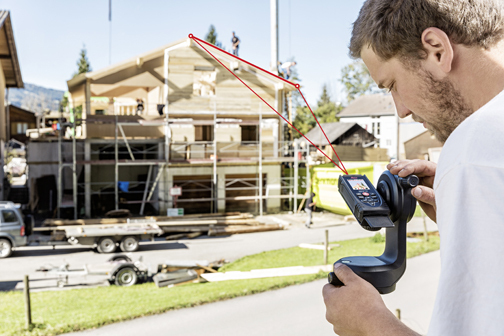 The Leica DISTO X-series is designed for use in harsh environments, combining measurement technology with a customised design for construction sites and an easy-to-use interface. The housing and keyboard are dust-tight and splash-proof so that measurements in rainy conditions are still possible. 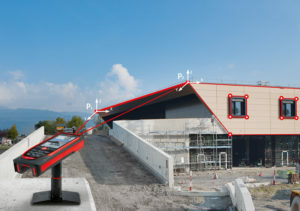 When designing the Leica DISTO X4, the team aimed to solve the problem caused by bright sunlight – that the laser spot of the devices would no longer be visible and the target could not be precisely targeted. So a digital Pointfinder camera and a 4x zoom was added, so that measurements can be taken over long distances and in bright sunlight. Even if the laser spot is no longer visible, the target can be clearly seen on the large colour display. The high resolution ensures a razor-sharp picture. As a result, distance measurements over long distances are possible with absolute precision. There is also a new DISTO Plan app, which works with all DISTO Bluetooth-equipped devices, making it easy to visualise and document measured objects. Objects can be sketched by hand and then scaled automatically with the distance measurement.